The largest United States monument dedicated to the volunteers who fought fascism in Spain is getting ready for repair. This summer the remaining onyx panels were removed. With support from your donations, ALBA is working with the Architectural Resources Group to replace them with scratch-proof, laminated tempered glass, in the same design, that will endure the tests of weather, vandals, and time. The monument was inaugurated in 2008 to great public enthusiasm, with speeches by then-mayor Gavin Newsom and several surviving Lincoln veterans. 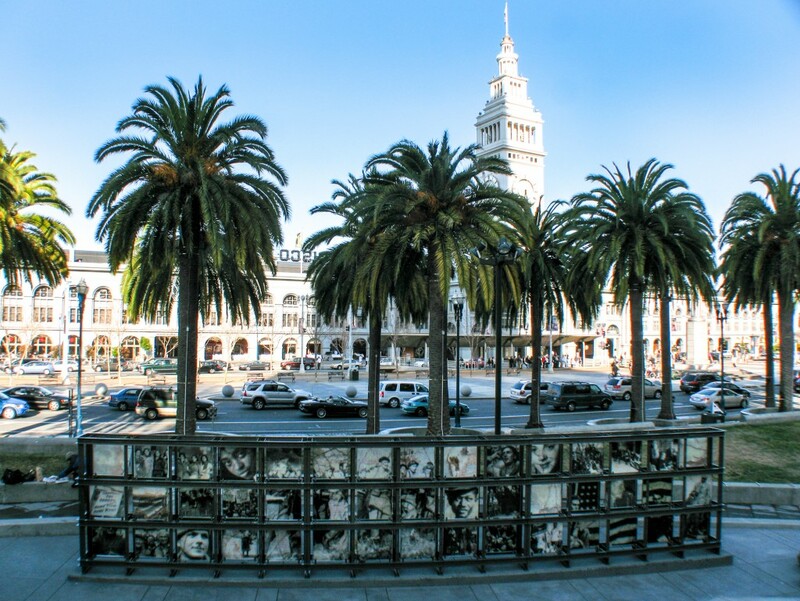 Designed by Walter Hood and Ann Chamberlain, the monument sits at the end of Market Street, across the Embarcadero from the Ferry Building. It consists of 44 translucent panels displayed in three rows in a large steel frame. The panels are printed on both sides with texts and photographs. Since its inauguration, the monument has been the target of repeated acts of vandalism. What proved more treacherous, though, was the Bay Area climate, which wreaked havoc on the onyx panels. Over time, an increasing number of them cracked along their naturally occurring veins. Working with the slowly-grinding gears of the city administration—in particular the San Francisco Arts Commission—ALBA has continuously pressed the city for a much-needed repair. With all the necessary approvals now in, the replacement panels will be produced this fall and, hopefully, installed before the end of the year. Stay tuned for a rededication ceremony in the spring!